credit hours through the ADA Continuing Education Recognition Program (CERP); see page 15 for more information. Individuals may present only one abstract (excluding Symposia, Hands-on Workshops and Keynote Speakers). Projects being submitted must be original research. Submitters may NOT split one study into several papers, as they may be asked to combine for review. Individuals can co-author multiple abstracts. the IADR Abstract Licensing Policy. Previously published abstracts (in print or electronically) or those presented at another meeting are not allowed. Abstracts should not be submitted on material that will also be presented at a symposium held at the same meeting. Abstracts must be submitted via the online abstract submission site. Faxes, photocopies or emailed copies will not be reviewed. You must receive the approval of all co-authors before putting their names on the abstract. There will not be an option for Late-Breaking News Abstracts. (IRB) or Institutional Ethics Committee or an equivalent ethical body. 2. Affirm that the work has not been published (in print or electronically) or presented elsewhere prior to the IADR Meeting. 3. Agree that if the abstract is accepted, IADR has permission to publish the abstract in printed and/or electronic formats. 4. Agree to pre-register for the meeting and pay the appropriate registration fee by the presenter pre-registration deadline of January 15, 2015. • The abstract will be automatically withdrawn from the Program Book and the Online Abstract System. • Submitter will not be allowed to present his/her abstract at the meeting. 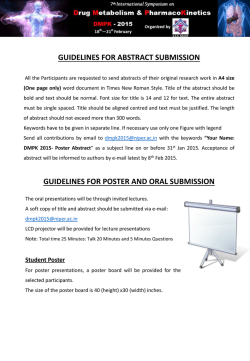 • The abstract will not be citable as being part of the Special Issue of the Journal of Dental Research. found under Title 17 of the U.S. Code, are exempt from any copyright transfer contemplated herein, and any purported transfer of the copyright to a U.S.
Government Work pursuant to this subsection shall be of no force or effect. by the presenter or the presenter is authorized to use said content along with any applicable intellectual property associated with the content. presentation, including but not limited to any claims of infringement of intellectual property or misappropriation of proprietary or trade secret information. approval on the abstract form and must be disclosed to the audience at the beginning of the presentation. to the best knowledge of the presenter. and attacks on colleagues, companies or products are unacceptable. • The Presenting Author is the only author that may request a presenter change. • Substitute presenter must be a co-author. • Substitute presenter must NOT be presenting another abstract at the meeting. • Substitution requests must be made PRIOR to the meeting. • You may withdraw your abstract at any time until October 14, 2014, without notifying IADR, in the abstract submission site. • Withdrawal requests must be received PRIOR to the start of the meeting. • Lack of travel funds is NOT an acceptable excuse for withdrawing an abstract from the meeting. changes to abstract text including typos, incorrect data, etc. will be permitted after October 14, 2014. Group/Network Abstract Reviewers and Group Program Chairs. organisms such as streptococci or candida. institution/affiliation. Please do not list the department/branch in the institution/affiliation field. One person must be identified as the presenting author. integral to the abstract and should be limited to no more than 1 or 2. Content of the Abstract: Titles, authors and authors' affiliations are not included in the 300 word limit (references are not collected by IADR). on the selection of key words. new information. Please make every attempt to enter the correct membership number for the presenter if he/she is a member of IADR. Chair Opportunities: Be prepared to enter whether or not the presenter is interested in serving as an Oral Chair or Poster Chair. submitters during the abstracts submission process. complete the online form by August 28, 2014. Individuals will be matched with our volunteers based on their expertise, geographic location and availability. for the corrections to ensure that the submission has used proper English language. website at www.iadr.org/iags to learn more about the abstract submission information. and again to the IADR abstract submission site after English language editing has been completed. facilitating the improvement of English language skills within the research community. Please contact IADR at ELAP@iadr.org if you have any further questions about this program. Failure to state objective and conclusion. Failure to state sample size and data. Excessive use of commercial product names. Typographical errors (remember that you can’t change any of your text after the abstract deadline). Writing your abstract at the last minute (this increases stress and leads to errors). Work that is duplicative is not well received and you will only be asked to combine with another abstract or your abstract may not be accepted. 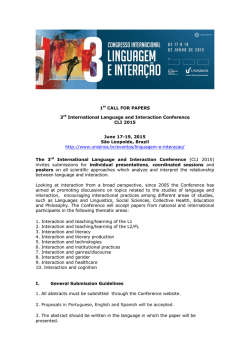 may benefit from English language assistance please submit your abstract for the ELAP program. the Author/Co-author Index online, the Program Book and the USB of Abstracts. HZ from that point onward]. deviations; and replace “30 ± 5” with “30±5”). Always use tables for the presentation of information when possible. Put units in headers and omit them from the rest of the matrix. Make sure that there is no inadvertent ‘dangling punctuation’ in the text, such as a comma or period that is not immediately adjacent to a word. Eliminate as many “articles” (a, an, the, …) as possible. (0.1mm/m), and statistically analyzed (ANOVA, Tukey’s, p<0.05).”]. Replace statements with equations [e.g., Instead of “10 samples were tested for each group” insert “(n=10)” into an appropriate sentence.]. Report all statistical differences with superscripts on results that can be attached rather than requiring separate statements. Construct tables to minimize the number of necessary cells. There are a number of other Group Awards available and information on each can be found on the IADR website. 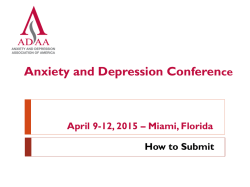 Click here to read step-by-step instructions for submitting your abstract online. abstracts are published and become part of the world’s scientific literature, it is important that the content be scientifically sound and grammatically correct. Each abstract is reviewed so that high standards can be ensured. 1. Abstract is not original research. 2. The research is not innovative in its approach to the stated problem (methodology or data collection or analysis or data interpretation). 3. Nature of problem not explicit from either title or abstract. 4. Material too closely related to another abstract submitted by the same co-authors; should have been combined into a single paper. 5. Abstract has been presented at other meeting(s) or previously published. 1. Methods not sufficiently precise to permit the measurements to be accurate, i.e., variations are within the error limits for the method. 2. Sampling method contains inherent discriminatory factors not recognized. 3. Size of sample insufficient to show significant conformity or differences. 4. No well-defined criteria given for evaluation of variables. 5. Choice of controls questionable. 6. No control groups reported. 8. Significance of results related to the nature of the problem being studied is not stated. 9. Conclusions do not necessarily follow as a consequence of the method of analysis applied to the data. 10. Conclusions not adequately qualified, i.e., conclusions have greater limitations than implied by the author. 11. Correlations suggested may be fortuitous insofar as no plausible cause-and-effect relation has been suggested, and none is obvious. 12. Abstract is not in English. 13. Abstract is over word count. the Group corresponding to the topic area of the abstract. academic and research institutions throughout the world, and to break down barriers to inter-institutional and interdisciplinary clinical and translational research. studies—including teratology, oral physiology, population studies, orthodontics, oral biology and temporomandibular joint function. treatment of medical emergency cases. includes evaluation of the accuracy and reproducibility of diagnostic methods as well as studies in clinical decision-making. systems, as well as the psycho-social and economic aspects of treating the older adult. environmental risk factors; research based on upstream prevention, with an emphasis on early health promotion at critical stages of the life course. biological investigation, tissue/material interfaces, and systematic clinical evaluation of implant materials and designs. cross-infection arising from any source, such as person-to-person contact or via fomites or aerosols. in bone resorption; regulatory factors in cell culture; ultrastructure and morphology; and morphology, physiology, and chemistry. evaluation relevant to dental practices and many others. of orofacial and TMJ pain and neuromuscular dysfunction. oral/craniofacial health and, conversely, the consequences of oral/craniofacial dysfunction on general nutrition and health. and wound healing and factors which affect it, as well as long-term follow-up data on research done in any of these areas. structure are appropriate insofar as they contribute to our understanding of disease, and cell, tissue, and organ cultures are also included in this category. Epidemiological, clinical, and laboratory research is encouraged. behavioral factors and study population characteristics of participants under 18 years of age, and caregivers of children. diseases, chemoprevention and chemotherapeutic approaches, host-defense mechanisms, and gingival and periodontal tissues. hazards of such agents, may also be included. applications to restorative dentistry in general, electrosurgery, ceramics, and acid-etch restorative dentistry. hypersensitivity), and oral and maxillofacial surgery. mucositis, and ulcers—provided there is sufficient emphasis on the salivary factors. student research on a global level. health of patients who suffer from dental, oral and craniofacial diseases. Women in Science Network: Abstracts related to gender and health disparities as well as women’s health will be reviewed. January 2015), to all registered, accepted presenters. that you will receive all important notices that are sent from IADR regarding your abstract and presentation at the meeting. (www.iadr.org/iags) or you can email IADR if you did not receive your notification (email meetings@iadr.org or fax: +1.703.548.1883). please make every attempt to complete your annual renewal in advance of the presenter pre-registration deadline to allow ample processing time. * Membership dues must be paid in full for the year 2015, on or before the pre-registration deadline for you to qualify for the member registration fee. Registrants who are not current members by the date of the meeting will be charged the non-member fee, and IADR reserves the right to charge the difference. • Up to six individual oral presentations in a meeting room. • PowerPoint Presentations (all equipment provided). • Presentations last 10 minutes; discussion after each presentation lasts five minutes. • Two Session Chairs facilitate the session. • Oral sessions will be scheduled Wednesday through Saturday. • Presented on a poster board in the Exhibit Hall. • Actual poster presentation time is one hour and 15 minutes. • Posters will be available for viewing all day on Thursday, Friday or Saturday. • No audio-visual equipment is used. • Poster sessions will be scheduled Thursday through Saturday. • Session Chairs will be assigned to facilitate the session. practical and possible. Presenters have the option to upload their full poster or oral slide presentation linked to their abstract. please contact IADR Senior Manager, Publications & Abstracts Kourtney Skinner at kskinner@iadr.org. CERP does not approve or endorse individual courses or instructors, nor does it imply acceptance of credit hours by boards of dentistry. IADR will announce the maximum number of continuing education credits available for this meeting when the scientific program is released (late January). eligible for the reduced member pricing. successful submission of your abstract. 3. Is there a word limit imposed on abstract titles? Yes, all abstract titles must be 10 words or less. 4. Is there a word limit imposed on abstract text? Yes, all abstract text must be composed of 300 words or less. Scientific Group/Network selection in Step 2. Be sure to save your changes and resubmit your abstract. 6. What is the abstract deadline? Tuesday, October 14, 2014 (11:59 p.m. PST). any circumstances. It is very important that you submit an error free abstract text. Meetings Department. However, please make every attempt to add all authors during the abstract submission process. number of programming factors must be taken into account during the programming finalization process. abstract submission process. References are not collected. 12. Is there a limit on the number of co-authors that I can add to my abstract? No. represented by the abstract will be published and/or presented at any other national or international meeting prior to March 11, 2015.
to Draft and selecting to Edit Draft. Book due to space limitations. Please make every attempt to list your department/branch separately from your affiliation/institution record. errors that appear in your abstract submission will also appear in the final online Scientific Program and in the USB of Abstracts. Abstracts may be formatted only to follow IADR publication guidelines or requirements.